After stumbling over some wines I thought were high class Bordeaux, I nailed this wine in one of the blind tastings for this article. In most tastings where a great Bordeaux is inserted with California Cabernets, the Bordeaux comes across as drier, more austere, and not nearly as rich and concentrated (California wines are inevitably fruitier and more massive). 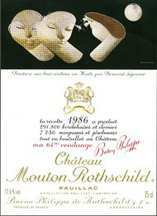 To put it mildly, the 1986 Mouton-Rothschild held its own (and then some), in a flight that included the Caymus Special Selection, Stags Leap Wine Cellars Cask 23, Dunn Howell Mountain, and Joseph Phelps Eisele Vineyard. Clearly the youngest looking, most opaque and concentrated wine of the group, it tastes as if it has not budged in development since I first tasted it out of barrel in March, 1987. An enormously concentrated, massive Mouton-Rothschild, comparable in quality, but not style, to the 1982, 1959, and 1945, this impeccably made wine is still in its infancy. Interestingly, when I was in Bordeaux several years ago, I had this wine served to me blind from a magnum that had been opened and decanted 48 hours previously. Even then, it still tasted like a barrel sample! I suspect the 1986 Mouton-Rothschild requires a minimum of 15-20 more years of cellaring; it has the potential to last for 50-100 years! Given the outrageously high prices being fetched by so many of the great 1982s and 1990s (and lest I forget, the 1995 Bordeaux futures), it appears this wine might still be one of the "relative bargains" in the fine wine marketplace. I wonder how many readers will be in shape to drink it when it does finally reach full maturity? The tasting notes for this section are from two single blind tastings, one conducted in May, 1996, in California, and the other in June, 1996, in Baltimore. Tasted at the Claret Club Mouton-Rothschild dinner. This is one of the finest bottles of Mouton-Rothschild of the decade. Stunning definition on the nose with a touch of mint and graphite, the palate imbued with an almost sorbet-like freshness and vitality. Wonderful symmetry and very classic and masculine towards the finish. Incredible persistency and yet still a long way to go. Tasted November 2010.